Pragmatism's founder, C. S. Peirce, initially envisioned philosophy as a means of rationally validating our beliefs and actions. Afterward, William James changed pragmatism into a way of undermining commitment to rational cogency. 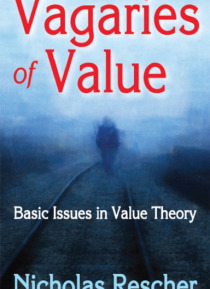 With the subsequent turn of various contemporary pragmatisms to relativism and subjectivism, such irrational tendencies have become still more prominent.Vagaries of Valu… e aims to create a version of realistic and rationalistic pragmatism that is systemically viable and does justice to traditional pragmatism's salient insights. Nicholas Rescher strives to return pragmatism to its realistic and objectivistic roots in a detailed survey of issues across the whole board of philosophical thought, action, and evaluation.Rescher argues that the crisis of pragmatism created by today's subjective tendencies should be met by adopting not a revisionary, but a reconstructive understanding of pragmatism, keeping close to its Peircean roots. He argues that such a turning does not mitigate against the pragmatic program's practical orientation, but provides an opportunity for sharpening our understanding of how pragmatism can and should be developed.